The Vive team at H&G has been getting cultural over the last few months – planning and executing a ground-breaking partnership with the Royal Academy to create an exhibition that explores the evolution of art (and more importantly, how VR will be part of that). How did we make that happen, well we’re glad you asked. Firstly, our client bought into the idea. Then, after working out how the hell we were going to do it, the team has been sorting out partnerships, finding 3D printers, liaising with VR developers, running preview events, public exhibitions and broadcast interviews, all in our bid to launch Virtually Real. So, what is it? Well, Virtually Real is the world’s first art exhibition merging the virtual and real worlds. 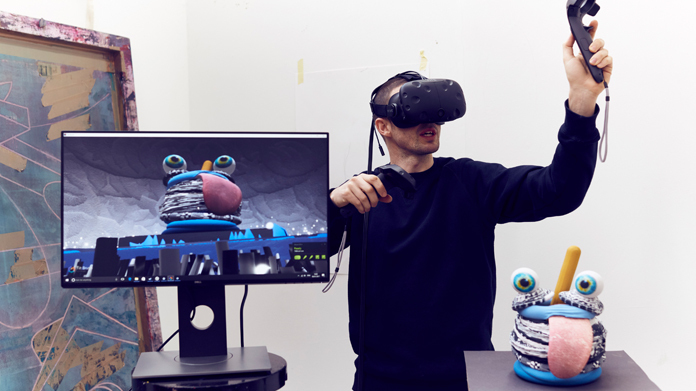 In plain terms, three Royal Academy artists, Elliot Dodd, Adham Faramawy and Jessie Jetpacks, created artworks entirely in virtual reality using Vive, before 3D printing elements and displaying them together – blurring the lines between the real and virtual worlds. So after that, we needed to make it a success in the press. Cue the teams at H&G and HTC working late nights and weekends to make sure that happened. Launching with a preview event in November, it was opened a fortnight ago with a media showcase on the Monday, (where we had over 250 guests, even with a tube strike) before a sell-out opening to the public from Wednesday until Saturday. The guests loved it, and the media did too. Amongst over 100 pieces of coverage, we have been on BBC London twice, BBC Worldwide, BBC Click, Channel 4 News, London Live, ITN and Euronews, as well as getting lovely write-ups from Standard online, The I, The Mirror, Sunday Telegraph, Sunday Mirror, as well as Dezeen, Elle, Design Week, AOL, MSN, BT, SBTV, Glamour, TimeOut and more … We even had the Minister for Digital and Culture, Matt Hancock MP attend and comment on the event. As you might expect, our clients are delighted.